﻿ PHOTOBOOTH rental inside a 1977 VW BUS, Groovy! Traveling through out the new england area, based out of boston! Traveling and Serving ALL New England States. Based in Massachusetts. set-up, friendly photo attendant, unlimited customized photo strips, image gallery, free downloads of all images, social media, choice of backdrop, and a lot of fun props. We currently drive our VW Photo Bus anywhere in New England. 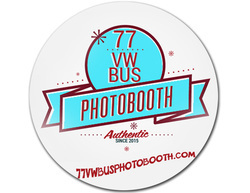 Click Here For Photos of our 1977 VW Bus Photobooth-Check back we're always adding cool photos of our photo bus! A VINTAGE 1977 VW BUS WITH A MODERN DAY PHOTO BOOTH INSIDE - VERY GROOVY! Event Ideas For The Photo Booth Bus: Weddings, Birthdays, Holidays, Family Reunions, & Fundraisers. Corporate functions: Brand our Bus! Add your company signage to further customized your event-grand opening, marketing, product announcements, Customer appreciation, & brand recognition and more!